Join the University of Illinois Alumni Association’s new virtual advisory panel—Illinois Alumni Insiders—and help shape future young alumni programs and services by sharing your needs, wants, values and preferences with us. WIN ILLINI SWAG: For every survey you complete, you will be automatically entered into a drawing to win swag such as Illini apparel and merchandise, Fighting Illini athletics tickets, Alice Campbell Alumni Center commemorative pavers and more! 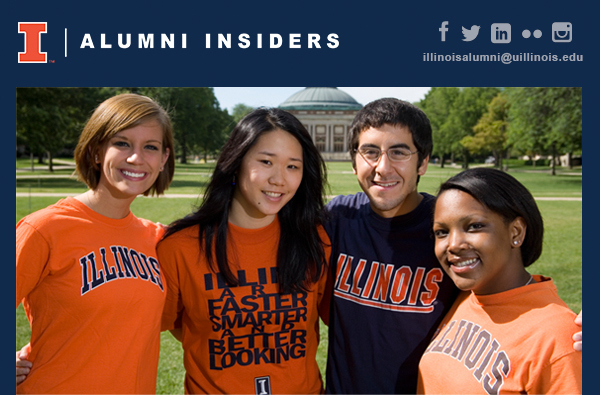 Please disregard if you have already signed up as an Illinois Alumni Insider.